Every once in a great while, the publishing world bears witness to one of two types of miraculous events: either (1) the release of a book which is, in every respect, perfect; or (2) the release of a book which is, in every respect, perfectly abysmal. With the publishing of Crystal Blanton, Taylor Ellwood, and Brandy Williams’s edited collection, Bringing Race to the Table: Exploring Racism in the Pagan Community, the twenty-first century is met with a splendid exemplar of the latter category—a book so bad that may very well be exemplifying the Platonic form of the Bad Book. As the book’s topic, racism within contemporary Paganism, is likely of interest to the readers of Counter-Currents (in part because Counter-Currents itself is featured in one of the book’s chapters), let us examine this wonderfully awful book in more detail. IN THE EAST, PLACE OF NEW BEGINNINGS, KNOWLEDGE, AND THE SUNRISE.WE CALL YOU MAYA ANGELOU, WE INVOKE YOUR WISE WORDS, YOUR ELOQUENCE, YOUR WISDOM, YOUR CREATIVITY. GUIDE OUR SPEECH AS WE COMMUNICATE OUR HEARTS AND MINDS AND ENGAGE IN THIS SACRED DIALOG. This introductory prayer is supplemented by a short essay by editor Crystal Blanton, which sets the tone for the understanding of what constitutes “racism” throughout the volume. Blanton follows suit with post-1960s sociological understanding of racism in stating that “racism is not, nor never has been [sic], just about a person’s prejudice regarding differences in race.” Rather, the racism she envisions is described as both institutional and structural in nature. While she concedes that while “overt forms of racism […] have continued to decline,” it is an “illusion that racism is no longer one of the prominent issues in the United States.” For Blanton to maintain her narrative—that a new, and invisible, racism has replaced the old, visible racism—she resorts to microaggression theory. In this way, Blanton is able to take something as seemingly innocuous as a white Pagan’s assumption that a black Pagan worships African deities as evidence of an institutional racism. In terms of analyzing institutional racism within contemporary Paganism, Blanton concludes that the “Eurocentric construction of the Pagan community leads to a structure that coincides with greater society,” leading to the imposition of a white “overculture” which systematically “others” non-whites, “and defines a system of privilege that makes Eurocentric thought the primary consideration.” It is this concept of racism—as a subtle, often unconsciously and unintentionally manifested, institutional and structural element within modern Western society—which generally informs the subsequent discussions of race within the book. 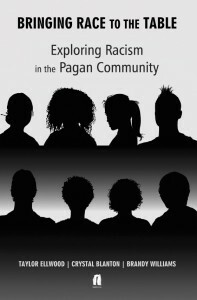 The book’s first section, “People of Color’s Experience of Racism” (23–82), features nine essays written by various non-white Pagans regarding their experiences of racism both within and without the social boundaries of the Pagan community. The function of this section seems to primarily serve as an outlet for these writers to describe some of the various microaggressions which they have experienced from other Pagans, and to lambaste white Pagans for their insensitivity to the plights of non-white Pagans. Herein, we are treated to such histrionics as a lamentation over the shooting of Michael Brown in Ferguson, Missouri in 2014; the bizarre assertion that the 2013 striking down of Section 5 of the Voting Rights Act of 1965 is an issue of paramount importance for Pagans; and the adolescent complaining of a black Pagan that he does not feel “represented” by New Age shops since most of them play Enya instead of Tupac over the speakers. However, the common theme present throughout nearly all of this section’s chapters is the narrative that white Pagans engage in cultural appropriation when approaching the religious practices of non-white peoples. Lilith Dorsey, a mixed-race practitioner of Vodou, recalls an attempt by an “uninitiated” white Pagan to “steal [her] religion” by attempting to participate in religious rituals which she did not feel he had a “right” to. Similarly, Janet Callahan, a Pagan member of the Oglala Lakota tribe, writes that she “can’t find it in [her] heart to participate in something that pretends to understand [her] Lakota ancestors without any contact to them,” in essence stating that those without immediate experience of Lakota ancestry and culture have no business claiming to represent Lakota religious beliefs or practices. The coup de grâce, however, comes from the chapters written by Cecily Joy Willowe and Bethie Jelen Vanderyacht, which serve as perfect examples of the schizophrenic views on race and religion which characterize the more liberal bastions of contemporary Paganism. Willowe presents a composite position which lambasts “White Pagan allies” for being the “forerunners of cultural appropriation,” noting that the specific religious traditions of many minority groups “are not accessible to outsiders and should remain that way.” However, this support for ethnic exclusivity with regard to native religious traditions is juxtaposed with a vehement disdain for “neo-Nazi Northern Heathen sects” who exclude those of non-European extraction from participation. Indeed, the Willowe finds “nothing scarier” than the notion that white Pagans would “sink into their whiteness” by limiting their religious expression to the beliefs and practices of their white ancestors and limiting participation in their circle to other whites. This double-standard, where it is perfectly acceptable for non-white Pagans to wish that their ethnic traditions be the exclusive property of the respective ethnic minorities with whom they originated, but it is completely unacceptable for white Pagans to treat their own indigenous traditions with the same degree of exclusivity, is entirely typical of contemporary Paganism. What is particularly interesting is that Willowe’s chapter exemplifies the—also typical—disregard for the hypocrisy of this very position. Indeed, far from calling for any kind of actual equal treatment within Paganism, the author uses her platform to beg for the imposition of a type of affirmative action within the domains of Pagan publishing and event coordination as a way for white Pagans to make an “offering” to non-white Pagans, as a way to correct the “over-representation of White voices of authority.” This “problem” can be addressed, she tells us by such trite measures as re-blogging articles written by non-whites, inviting them to be guest bloggers on one’s website, or by granting them key speaking and presenting positions at gatherings and events. In this way, we find liberal Paganism to be a perfect mirror of broader liberal society, where minority members cry for special treatment to address perceived slights while at once adhering to an ideology which allows them to engage in the exact type of discrimination that they find so abhorrent in whites. The book’s second section, “Historical and Mythological Racism” (83–166), is a more mixed-bag of articles written by a variety of non-white Pagans and white Pagan “allies.” One of the more common themes present in this section is that of white Pagans both lamenting the fact of their own whiteness, and scrambling to conjure up ways in which they can engage in some manner of reparations for the historical “wrongs” done by whites to non-whites as well as the institutional racism they see still currently holding sway over the Western world. What I am is a White U.S. Euro-American colonial descendant of invaders and squatters, occupying stolen indigenous land, consuming indigenous resources, and taking advantage of a social, economic, and political system that was set up to benefit people like me at the expense of everyone else. […] I should probably mention that I am not a “normal” white person. I’m from the hood; my best friends growing up were black, most of my friends are non-white people, the majority of people in our neighborhood and at our schools were black, I listen to black music and watch black movies, my casual and default mode of speech falls outside “Standard American English.” My parents are political activists who instilled in me anti-racist values. I don’t consider myself a part of white culture at all, at least not in any voluntary way! So I think it was interesting that I ended up joining an order that is so painfully white. The picture presented by this narrative is almost a caricature of the stereotypical Guilty White Liberal, who is at once ashamed of his whiteness and enraptured with the cultural trappings of another race which he seeks to emulate. What is particularly interesting about this tale of woe is his naive astonishment that he would be met with something less than fraternal fellowship by inserting himself into an organization which—by his own admission—he knows does not share his beliefs concerning race, and then attempting to impose his beliefs upon the group’s membership. This, again, seems to be broadly illustrative of patterns of behavior among modern Pagans, where anti-racist activists (1) knowingly join groups which they deem to be borderline “racist,” (2) engage in attempts to fundamentally change these groups, and then (3) publicly complain of their mistreatment by these groups after their attempts at change are rebuked. It is a behavioral pattern which seems to oscillate between narcissistic personality disorder and a calculated tactic to discredit targeted organizations. The other chapter within this section which bears specific mention is Amy Hale’s, “Marketing ‘Rad Trad’: The Growing Co-Influence Between Paganism and the New Right,” which explores the networks of connections between different Neopagan and New Right currents—Radical Traditionalism in particular. Trained as an archaeologist, Hale is currently a lecturer in Liberal Studies at Golden Gate University in San Francisco, and is one of the several contributors to the book hailing from the world of academia— one of two holding a doctoral degree (the other being Carla-Elaine Johnson, who lectures in English at Augsburg College in Minneapolis). Hale’s paper has the distinction of being the closest thing to a sound academic paper in the book, although it does fall short in several key areas—most notably in terms of the historiography of the currents in question. This chapter has the additional accolade of treating the subject under investigation with a remarkably neutral and agnostic perspective, being more concerned with describing connections between Neopaganism and Radical Traditionalism than with any polemical or apologetic agenda. She ties this into her connective narrative by seeing both that “Pagans and esotericists” have shown themselves to be “very active in the promoting and disseminating of the ideas of the New Right, as well as that “New Right activists” have been “attempting to promote these ideas among Pagans.” Her conclusion, then, is that the nature of the relationship between Radical Traditionalism and Neopaganism is such that neither is reduced to a function of the other, but rather that each—in turn—serves as a pathway of access from itself to the other. With more evidence to support this conclusion and more in-depth historical analysis of the currents under analysis, this could be a very good paper. However, as the book’s chapters were neither subjected to peer-review nor were the editors in possession of the scholarly acumen to make up for this processual omission, the paper remains wanting. The book’s third and final section, “Being an Ally” (167–252), is a collection of essays written by a mixture of white and non-white Pagans on topics generally relating to the theme of how white Pagans can be “allies” to their non-white counterparts. The common denominator between these chapters is that nearly all of them are composed largely of laundry lists of what white Pagans are currently doing “wrong” in respect to their relationships with non-whites, and what changes they much make in order to conform to the anti-racist vision of a “correct” relationship. Among the white authors in this section, we see the same self-hatred as present as in the previous section; this is exemplified in Kat Baily’s assertion: “I have never been comfortable in the white skin I occupy.” As with Willowe’s previously discussed plan for affirmative action within Pagan blogging and event coordination, many of the suggestions presented in Bringing Race to the Table’s third section mirror proposed solutions to the “problems” of structural racism within broader society—treating the Pagan world as a microcosm of this macrocosm. The specific strategies presented are, thus, the same tired ones which we have heard proffered by social activists since the 1960s. From Odinsdottir, we hear an adjuration to create a separate space for “marginalized groups within” the already marginalized Pagan community. And from T. Thorn Coyle, we are told that we must examine “the ways in which our sub-cultures may not feel welcoming,” to avoid unintentionally offending non-white Pagans by being too welcoming to white Pagan sub-sets who might make non-white Pagans nervous (i.e. racialist Pagans). All in all, what we see in Bringing Race to the Table is a collection of “arguments”—if, that is, rhetorical talking points presented in absence of either empirical evidence or cogent logical argumentation can indeed be termed arguments—of similar type and quality to what you see on any Facebook group operated or populated by leftist Pagans. What, then, is it that makes this book so bad that it epitomizes the Platonic Bad Book? In this case, it is that the whole supervenes over its constituent parts. While each chapter is, in and of itself—with Hale’s being the exception—a poorly researched and poorly written opinion piece, the resulting whole that is the book emerges as a masterpiece of trite anti-racist absurdity. Content aside, the book’s technical failings alone could win it awards for horrendous publishing. In a book which makes attempts to present itself as an academic text, we see either an utter misunderstanding of or disregard for scholarly research methods and decent writing conventions. In what world is it, for example, appropriate to use Buzzfeed and Wikipedia as objective references for topics in social psychology? Further still, even if one were to ignore the arguments and scholarship, and simply examine the book as a work of printing—it fails in every conceivable way in regard to style and editing standards. There are innumerable instances where the text changes both color and font mid-paragraph, instances where necessary spaces between words have been mysteriously forgotten, instances where footnotes begin with nonsensical punctuation marks or improper capitalization, etc. That the three individuals in charge of putting this book together even call themselves “editors” is in and of itself a farce. It is painfully obvious from even a cursory glance at a single chapter of the book that no one reviewed the finished product before releasing it to the open market. However, for Counter-Currents’ readers, this book’s varied and numerous failings seem a boon. For, we can hope that a book so poorly researched, written, and executed will at least turn discerning readers away from the book itself, if not the positions argued within. And in all honestly, I find it incredibly difficult to imagine that any intelligent reader—whatever his political leanings—would seriously recommend this book to anyone else after reading it. Anderson, Zack. “A King Concealed: White Privilege in Thelema.” In Bringing Race to the Table, 132–44. Bailey, Kat. “Removing My Color-Blind Glasses: The Journey from White Liberal to White Ally.” In Bringing Race to the Table, 196–205. Better, Shirley. Institutional Racism: A Primer on Theory and Strategies for Social Change. 2nd edition. Plymouth, UK: Rowman and Littlefield Publishers, 2008. Blanton, Crystal. “Understanding the Definition of Racism and its Power in Our Community.” In Bringing Race to the Table, 12–19. Callahan, Janet. “Native Appropriation.” In Bringing Race to the Table, 42–46. Coyle, T. Thorn. “Racism is a Pattern.” In Bringing Race to the Table, 174–8. Dorsey, Lilith. “Beautiful Black, Wondering White, and Shady Grey: Racism in the Pagan World.” In Bringing Race to the Table, 38–41. Eyers, Pegi. “Beyond the Pale: Lifting IK and Inventing Identity.” In Bringing Race to the Table, 156–66. Hale, Amy. “Marketing ‘Rad Trad’: The Growing Co-Influence Between Paganism and the New Right.” In Bringing Race to the Table, 103–121. Knight, Shauna Aura. “Facilitating Inclusive Rituals and Events.” In Bringing Race to the Table, 179–89. Odinsdottir, Xochiquetzal Duti. “Newly Revised List of Things I Wish White Pagans Realized.” In Bringing Race to the Table, 169–73. Smith, Ryan. “Racism, Heathenry, and Frith.” In Bringing Race to the Table, 150–55. Spider, Reluctant. “Between the Worlds.” In Bringing Race to the Table, 23–32. Sue, Derald Wing. “Microaggressions, Marginality, and Oppression.” In Microaggressions and Marginality: Manifestation, Dynamics, and Impact, 3–24, edited by Derald Wing Sue. Hoboken, NJ: John Wiley and Sons, 2010. Taylor, Matthew. “The Black Witch.” In Bringing Race to the Table, 78–81. Theurer, Rhiannon. “Ancestor Work and Anti-Racism.” In Bringing Race to the Table, 145–49. Vanderjacht, Bethie Jelen. “Labels, Assumptions and Paganism.” In Bringing Race to the Table, 62–66. Walker, Heaven. “Bringing the Ancestors to the Table.” In Bringing Race to the Table, 11. Willowe, Cecily Joy. “Derailing the Conversation: Cultural Appropriation in Online Pagan Communities.” In Bringing Race to the Table, 67–77. Hale, “Marketing ‘Rad Trad,’” 114–15. Walker, “Bringing the Ancestors to the Table,” 11. Blanton, “Understanding the Definition of Racism,” 14. Institutional racism, in modern sociology, is generally conceived of as something which—currently at least—is a strictly unidirectional process which whites inflict upon non-whites. For an example, see Better, Institutional Racism: “Institutional racism denotes those patterns, procedures, practices, and policies that operate within social institutions so as to consistently penalize, disadvantage, and exploit individuals who are members of nonwhite racial/ethnic groups” (p. 11). Blanton, “Understanding the Definition of Racism,” 15. For a general contemporary definition of ‘microaggression,’ see Sue, “Microaggressions, Marginality, and Oppression”: “Microaggressions are the everyday verbal, nonverbal, and environmental slights, snubs, or insults, whether intentional or unintentional, that communicate hostile, derogatory, or negative messages to target persons based solely upon their marginalized group membership” (p. 3). Vanderyacht, “Labels, Assumptions and Paganism,” 63. Taylor, “The Black Witch,” 80. Dorsey, “Beautiful Black, Wondering White, and Shady Grey,” 41. Willowe, “Derailing the Conversation,” 67. Willowe, “Derailing the Conversation,” 75. Anderson, “A King Concealed,” 133. Hale, “Marketing ‘Rad Trad,’” 114. Odinsdottir, “Newly Revised List of Things I Wish White Pagans Realized,” 169. Knight, “Facilitating Inclusive Rituals and Events,” 179. Baily, “Removing My Color-Blind Glasses,” 196. Odinsdottir, “Newly Revised List of Things I Wish White Pagans Realized,” 170. Coyle, “Racism is a Pattern,” 176. See: Spider, “Between the Worlds,” 32; Theurer, “Ancestor Work and Anti-Racism,” 145; Smith, “Racism, Heathenry, and Frith,” 153. See: Willowe, “Derailing the Conversation,” 72; Eyers, “Beyond the Pale,” 158. See: Eyers, “Beyond the Pale,” 158; Coyle, “Racism is a Pattern,” 178.